The anxiety of waiting for a decision on your first ever academic paper is unbearable. It starts immediately after you hit that submit button and ends up when you receive THAT email. While writing that first paper you’ve most likely ensured that everything is clearly explained and justified. And your supervisor, who is a big name in your field, has also given it a green signal so chances of it not getting accepted is pretty low, right? Wrong. A lot of things can go horribly wrong – or let’s just say not according to your dream plan. Let’s start with that e-mail. When I got a big fat rejection (BFR) e-mail for my first paper I was pretty disappointed, to say the least. Because the publisher is based in the US I read the e-mail sometime in the middle of the night and didn’t manage to sleep thereafter. This was unexpected. This was a new territory that I hadn’t experienced before. I had already planned to add the first paper to my CV and dreamt of numerous citations within few months. I woke up, still in shock, and fired up my MacBook to read that email clearly. The short story is that the reviewers weren’t happy with the work and had raised some points which I found unreasonable and unsubstantiated. Of course I couldn’t see their logic. They were wrong and biased and there was no other explanation. I forwarded the e-mail to my supervisor and then couldn’t sleep despite repeated attempts. I cleared my head and toyed with the possibility of there being some reason in reviewers comments. I concluded it was my writing style that failed to convince them and I ended up buying 3 books on how to write an academic paper and reading one entirely that day (skipping work). Next day, I decided to read that email again with one change – not being emotional about my work. I decided to see it from from the reviewers’ point of view and immediately saw some shortcomings (not all, mind you). Many comments were useful, some showed arrogance and a few ignorance too. I discussed all of them with my supervisor in detail and it was decided to submit it in a different journal for publication – making some improvements based on the review (that made sense to us). Guess what? I got another BFR! This was disappointing too – but not as bad as the first time. The horrible thing with these is that you get the decision 3-4 months after submission and have moved on to doing something else by that time. Anyway, this time there was no criticism of the work. The reason for rejection was that the paper was somewhat out of scope of the journal. We had already anticipated that before submission but then there were similar papers published recently that guided our decision. Without any further changes, I sent it to yet another journal. By now I was fed up. I spent about 8 months doing the work that was being presented – cancelling one of my planned holidays, and 10 months had passed since the first submission. Two more months and I received an email with Major Revisions. This was celebrated as progress! 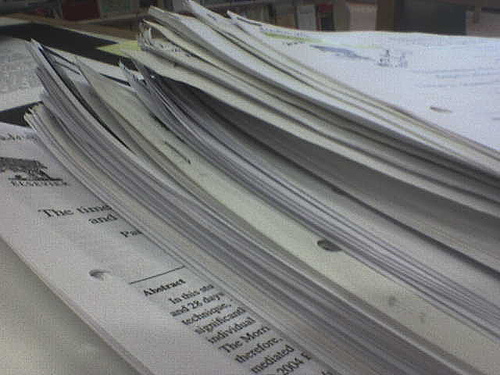 I have read somewhere that major revision is the most common decision given to papers (after rejection). I was delighted at first but when I saw the revisions they asked for, I freaked out. It was too much work, very different from what I had been doing in the last 12 months. I had six months to do the revisions. Reluctantly I agreed to do it (was there a choice? maybe) and estimated it would take 3 months of my time. Actually a co-author (and a colleague) on this paper, who is super duper intelligent and highly regarded, convinced me to do it. He drafted a nice reply to the reviewers explaining each of the changes I made. We got another round of minor revisions after submitting the heavily modified versions. These were small changes and by this time I was convinced I have passed the review cycle. Few more days and it was finally accepted. And the feeling of joy I felt made me realise all the effort put in was totally worth it. Although, if it wasn’t for the co-author and the supervisor I’d have given up after first attempt. Recently I ended up reading the very first draft that was rejected and compared it with the final thing that was accepted after lots of changes. The two are very different. The content may be similar but the changes are definitely for better i.e. clear presentation, useful addition of figures, better introduction, etc. I realised that the end paper was not exactly what we planned initially. The review process had a large influence in its final shape and actually improved it. My view now is that although the review system isn’t perfect and often results in some biased comments it does eventually lead to an improvement in the paper quality (this can easily be disputed). To all those who haven’t published yet, brace yourselves for an emotional time ahead! The first rejection hurts – badly. And for those who have been rejected, keep trying. The end result is absolutely worth every effort!